Taking notes -- Enjoy Pronto's ergonomically engineered keyboard while employing the built-in wordprocessor to write notes, email, and papers. You can read and write in computer braille and Grade 2 braille. In fact, you can read in one mode and write in the other. Documents can be used in Microsoft Word .DOC, and .DOCX formats as well as text and braille formats. Reading books on the move -- Use Pronto's built-in Daisy book player to read books any time, anywhere. Better yet, use Pronto's unique .PDF viewer to read .PDF files on the go. No need to wait until you are at a computer. Enjoy Pronto's high-quality Vocalizer speech fromNUANCE or choose fast and efficient Eloquence speech. Controlling Your Schedule -- Track your appointments in Pronto's Planner. The Planner can be quickly and easily synchronized with Microsoft Outlook. Finding addresses and phone numbers quickly -- Search your contacts list which is also fully synchronizable with Microsoft Outlook. You can create personalized filters and masks here as well to further optomize searching and working with contacts. Connecting to the World -- Leverage the power of Windows Live Messenger and Pronto's POP3 email client to stay constantly in touch with the world around you. Talk and email with friends, family and coworkers. Recording brief voice notes or meetings -- Switch on Pronto's voice recorder with the touch of a button to record a quick note. Software controls are also available for longer recordings, stored on an SD card. Using a calculator -- Perform quick calculations on this multifunction internal calculator. Cut and paste the results as needed into the word processor. Listening to music -- Switch on Pronto's audio player which can play both .MP3 and .WAV files or tune into the built-in INternet Radio to hear radio stations of any genre around the world. Tracking the Environment -- Press easy-to-reach keys to discover temperature, compass direction, altimeter reading, time, date and battery status. All is available at the touch of a button. 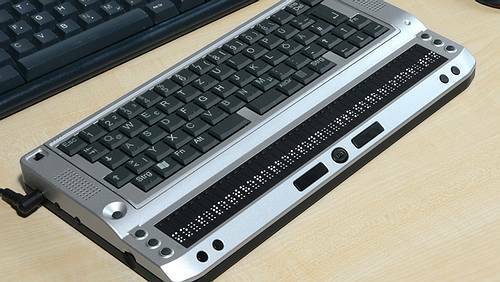 Maximizing the ability to use braille -- Allow Pronto to act as a braille display when attached to your laptop or desktop computer. Pronto interfaces with Cobra, Window-Eyes and Jaws for Windows as well as other products.